Meguiar’s extra thick microfiber wash mitt is the ultimate choice for show car perfect finishes. The clear coat safe micro- fabric lifts and traps dirt and grime for a brilliant, swirl- free finish. The comfort-fit cuff and soft inner lining make this wash mitt a pleasure to use. With extensive knowhow in this domain, we are indulged in providing a supreme quality gamut of Wash Mitt. 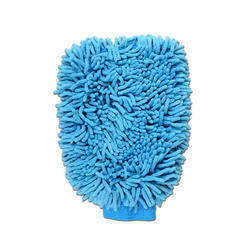 Microfiber Cleaning Mitt mops are engineered for lint-free wet mopping and are super absorbent. These microfiber mops are constructed with 100% continuous filament microfiber woven fabrics. 1 Microfibre Soft Car Cleaning Mitt Dust Double Sided Glove. Micro Fiber type hand glove for car/bike cleaning. Gentle on your vehicle's finish. 100% Scratch and Lint Free. Elastic cuff keeps mitt snug. - Multi-purpose washing, dusting and cleaning mitt. Our organization is certified in offering premium quality Microfibre Mitt Gloves. This product is made available in different sizes and designs as per the clients requirements at affordable rates.